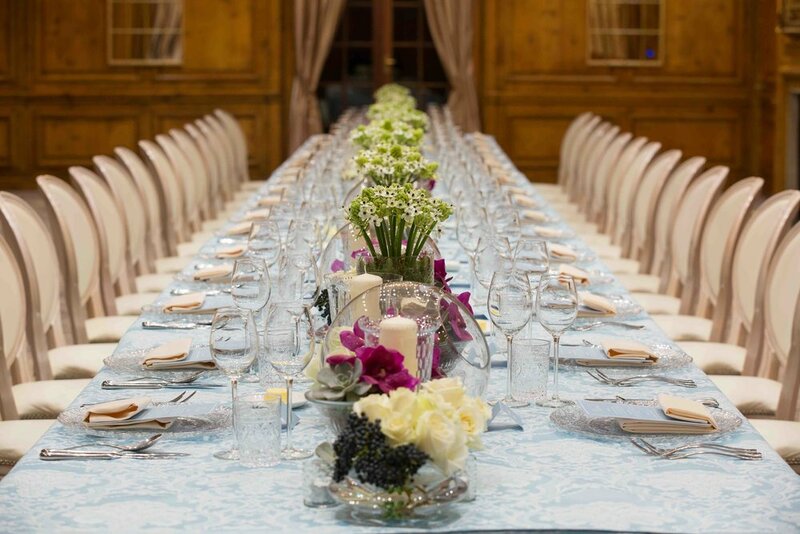 We were invited by the Shephard family and Moving Venue to attend a Bridal Supper Party at the magnificent Hedsor House to view their recently refurbished Ballroom and 11 bedrooms that were added in June 2015. The gorgeous Buckinghamshire countryside venue in Taplow is located just 45 minutes from London and provides the perfect escape to a 100 acre estate of countryside elegance. Given as a wedding present to Florence and Philip Shephard in 1934, Hedsor House has remained in the Shephard Family for four generations. Today, the house is run by brothers Nick, Mark and Hamish Shephard - who welcomed us to the evening's banquet. The evening began with a champagne and canapé reception in the Central Hall, during which time we were invited to tour the magnificent house. The particular highlight was the sumptuous Bridal Suite - one of the largest in Europe - offering ample space for you and your bridesmaids to get ready together. Not to mention the marble Bridal Bathroom boasting a double shower with a chandelier overhead (we're not joking!). 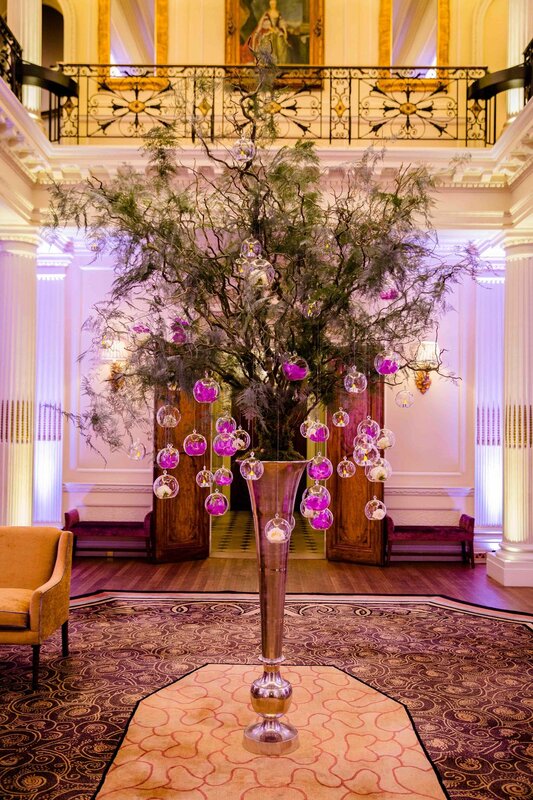 InWater Flowers provided beautiful floral designs throughout, from an impressive tree decorated with romantic rose and orchid filled votives in the Central Hall, through to the elegant arrangements in the Grand Ballroom boasting a long banqueting table set for supper. Head chef, Simon Packer of Moving Venue put on a delicious three course dinner. We were spoilt with shaved breast of smoked duck with confit duck polenta chips, whipped sheep's milk curd, fig confit, duck crumble and a pomegranate and apple salad to start. The main course was a rosemary roast best end of lamb with sticky glazed neck, miso roast aubergine, pea mousse, lamb bacon, hazelnuts, baby Chantenay carrots and a pea cream. And to finish, we were treated to the most beautiful champagne, strawberry and rose mousse. sprayed in white chocolate with wild strawberry jelly, served with Champagne sorbet and crystallised rose. 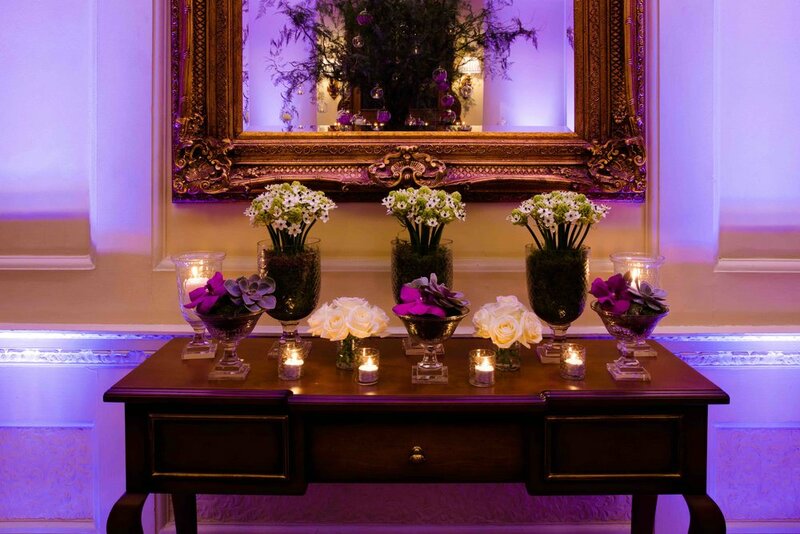 The house was originally designed by Sir William Chambers, the architect of Somerset House. Hedsor House was also once famously the home of Dowager Princess of Wales, mother of George III and the founder of Kew Gardens. Following a fascinating 800 year history together with decades as the seat of the Shephard Family, the exquisite Georgian house underwent an extensive renovation and restoration project in the mid-late 2000s. In 2007, Hedsor re-opened her doors to the world by starring as Nicole Kidman’s home in the box office hit, The Golden Compass. Today, the house provides a picturesque private events venue and has earned a reputation as a 'playground for partygoers' attractig A-List celebrities from around the world including Johnny Depp, Sting, Maggie Smith and Jeremy Piven. Thank you to Hedsor House for the overnight stay and a most enjoyable evening - it was a pleasure to be wined and dined (and to be guests for once!) at this fabulous venue. 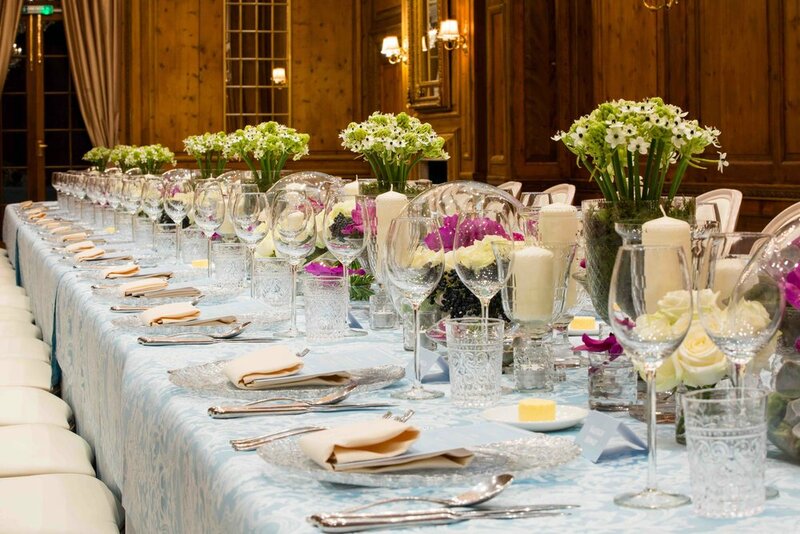 If you are interested in having your wedding or event at this exclusive venue, get in touch and we would be delighted to help you plan an unforgettable occasion that is distinctively yours at Hedsor House!